Buzz Kill Ramblings of Tim Louie: THAT'S MR. CHEESEBURGER TO YOU! Changing your name is one thing, but changing your name to something you like to eat is something that is pretty insane. It turns out, a British man, formerly known as Simon Smith, has legally changed his name to something a bit more carnivorous.... "Bacon Double Cheeseburger." That's right! He changed his name to Bacon Double Cheeseburger! That's like me changing my name to Linguine with White Clam Sauce! Who the hell does that? I mean Simon Smith is a pretty basic name, but Bacon Double Cheeseburger? Come on! The name change was inspired, like many bad ideas, by an evening of heavy drinking. Cheeseburger told one news sources, "It was the culmination of probably too many drinks in the pub where there was a conversation about names. Bacon Double Cheeseburger was pretty much the first thing that came up. Everyone loves bacon don't they?" Cheeseburger went on to tell the newspaper that his new moniker is "the most ridiculous thing" he and his friends could think of. He said, "My friends were quite supporting of anything that makes me look silly, as good friends are." Hey, I'm all about making my friends look silly too, but to legally change my name to Bacon Double Cheeseburger? That's so stupid! Besides, wasn't there a way to stop this moron from legally changing his name? Couldn't they tell he was drunk? Cheeseburger said his new name hasn't affected his career as a consultant in the oil and gas industry. He says, "My work speaks for itself and people keep hiring me." What a liar! He later acknowledged that he uses the name he was born with on his resume and doesn't inform employers of his real name when he's applying. He said, "I usually drop the bombshell after the contracts have been signed." Once the word got out that a man really named himself Bacon Double Cheeseburger, fast food outlets came calling, including Byron Hamburgers, a British-based burger chain. They tweeted, "Hello, Mr. Cheeseburger. If you come down w/proof of your name we'd be delighted to serve you a double bacon cheeseburger on us." Cheeseburger's fiancee is said to have a "beef" with her future new name. He said, "My fiancee is fairly reluctant about marrying a Cheeseburger. That's something we're discussing a lot. No girl ever dreams of spending her big day marrying a man called Bacon." Hey, if that's his name, then that's his name, right? My wife wasn't all too thrilled about changing her last name to Louie, but it grew on her. So, get use to it Mrs. Cheeseburger! I'm suddenly getting hungry! 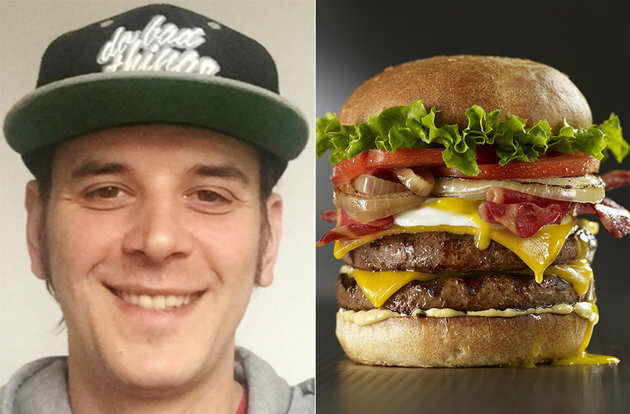 Cheeseburger is one of 85,000 Britons who legally changed their name in 2015. Other unusual names adopted by people included "Happy Birthday," "Sarge Metalfatigue" and "Simply MyLove Poet." These are some pretty dumb names. I always felt my name was pretty weird too considering people always commented that I had two first names. I always wanted to legally change it to Bruce Lee, but then I would have a lot to live up to. What would you change your name to if you legally changed your name?